You’re getting ready to start feeding birds? That’s a great idea and you’re likely to enjoy it immensely. When it comes to making those first steps, it’s very important to choose the right seeds. There are several steps you can follow in terms of seed selection and making sure that you’re attracting the right bird species to your garden. All birds love sunflower seeds but if you opt for those, make sure that you’ve gotten the right variety. The market features two kinds of sunflower seeds – the ones that are completely black and the striped variety. Black sunflower seeds have a very thin shell that all types of birds can get through. The seed inside is high in fat, making it a great nutritional choice for the winter. 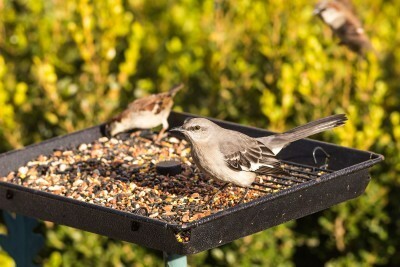 If you’d like to control the types of birds coming to your backyard, opt for the striped sunflower seed variety. These seeds have a thicker shell and birds like sparrows can’t eat them. The sunflower seeds are also loved by squirrels. 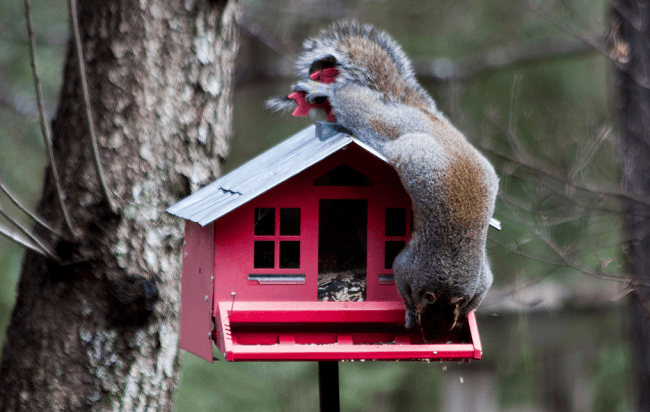 You may want to get a special bird feeder that has squirrel protection. Alternatively, place some nuts and seeds for squirrels in a separate feeder. This way, the little fur balls will leave birds alone. Dried Corn – What Birds Prefer This Seed? Dried corn is very common and rather inexpensive. The question is whether this type of seed is suitable for all birds and if they’d enjoy it. Some types of birds do enjoy cracked corn. You can attract blue jays, red-winged blackbirds, native sparrows and several other types of birds with it. Keep in mind, however, that corn is a favorite meal for various mammals. Foxes, deer, raccoons and squirrels will be eager to pay you a visit and have a delicious snack. Another important thing to keep in mind is that corn can be contaminated with toxins during the production process. It’s usually treated with fungicides that maximize yield. Such corn varieties can be toxic to birds. You may want to include very small amounts of corn in the bird food mix. Also, it’s a good idea to check what the origin of the corn is and how the plant has been treated. White millet is also a great snack for birds. It’s another type of seed that’s best when used in moderation. White millet can be scattered throughout the yard during the migratory periods of sparrows. These birds love it and they’ll definitely pay you a visit. Nearly all types of sparrows love white millet and some other types of birds you can attract with it include indigo buntings, quails, doves, cardinals and juncos. Usually, the birds that like white millet will also be attracted to black sunflower seeds. If you don’t have one of the seeds, you can easily substitute those for the second variety. Chances are that both will bring a big number of birds to your backyard. Cardinals are beautiful, colorful birds found in both North and South America. They have a very strong beak, which enables them to crack and eat some of the seeds that other birds can’t feed on. This specific makes it easy for you to attract cardinals. Safflower seeds are ideal for the purpose. Safflower seeds have a very hard shell. The overwhelming majority of birds will be incapable of cracking these seeds open. Cardinals, on the other hand, will enjoy the delicious treat. A few other bird species that may like safflower seeds include doves, grosbeaks and chickadees. It’s interesting to point out that squirrels don’t like safflower seeds. If you aren’t interested in feeding the little mammals, these seeds will be the right pick for you. Raw peanuts are very popular among most birds and among a big number of mammals, as well. When feeding animals with peanuts, go for the raw, unsalted variety. This treat is a particular favorite of jays. The birds are likely to take away large quantities of peanuts from the feeders and store them somewhere else. Always place peanuts in a dry place. When exposed to moisture, they will develop some pretty powerful toxins that can be deadly to birds. If peanuts remain in the garden and they’re uneaten for some period of time, you’ll need to discard those and replace the food with a fresh portion.